I spent Saturday night at the observatory first sweeping up –dead ants everywhere– and then experimenting with the 9-inch telescope. Three local high school students saw that the front door was open and stopped by for a visit. I spoke with them a bit about the observatory and telescope, gave them a look at the Moon, and sent them on their way — this was not a scheduled open night! The Moon was big and bright and, unfortunately, was washing out 'most everything else in the sky. My main target for the night was to have been the grand M4 globular star cluster in Scorpius. Couldn't see it… too close to the Moon. So I tried something I'd not experimented with before and hand-held my FinePix digital camera to the ca. 1900 telescope's fist-sized eyepiece and shot some photos. 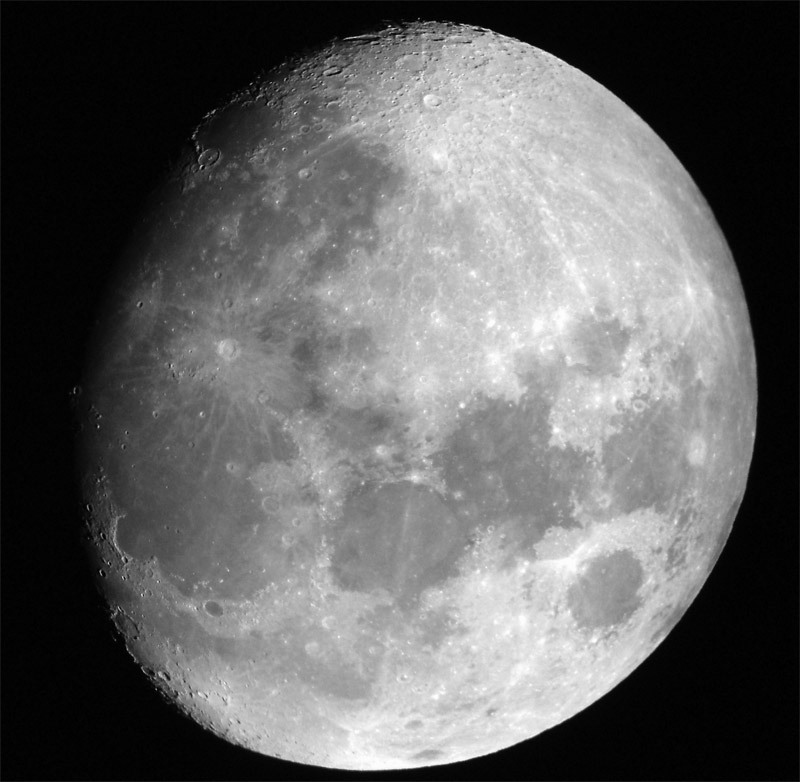 The big eyepiece presents bright, sharp low-magnification views and is my favorite for observing any phase of the Moon. It turns out to be perfect for the "afocal" photographic technique as well! A couple of the images were quite good and I am delighted with them. Converting the images to grayscale seemed to help so that's what I am displaying here. First is the whole, waxing gibbous phase disk… about three days from full. 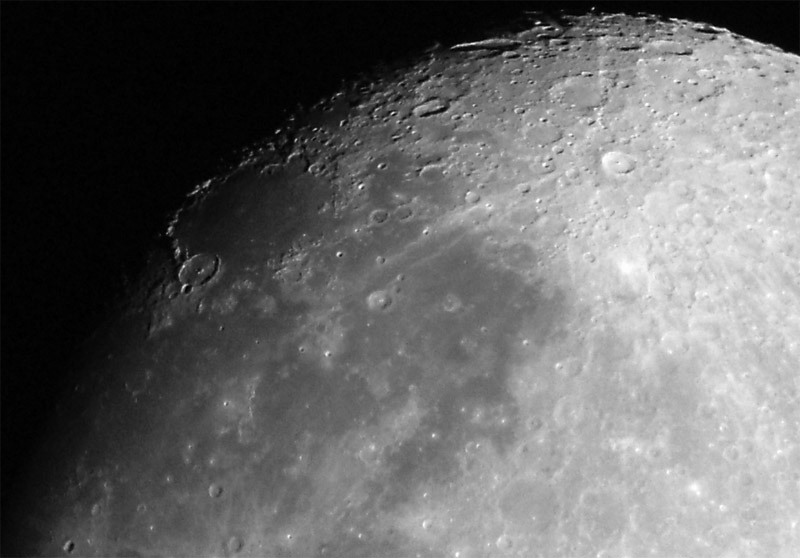 The second image is detail from the full disk shot. Later I practiced use of the telescope's clock-driven right-ascension (R.A.) clock and indicator. With some effort I was able to find the beautiful galactic pair M81 & M82 in the northern sky; that was the first time I'd been able to find those galaxies with the big scope! The view wasn't so good as the slightly hazy sky was lit up, even that far north, by that old devil Moon, but the success boosted my confidence. I should now be able to more easily find charted objects… I still must master aiming in declination to really locate things! In all, a good night. Really beautiful photos! Wow! Impressive. Great shots! Makes me want to go buy a zoom lens. I wonder if a tripod could help with that and get the picture even sharper? What great images! Really gorgeous detail. And your last reply to Jeff is interesting.